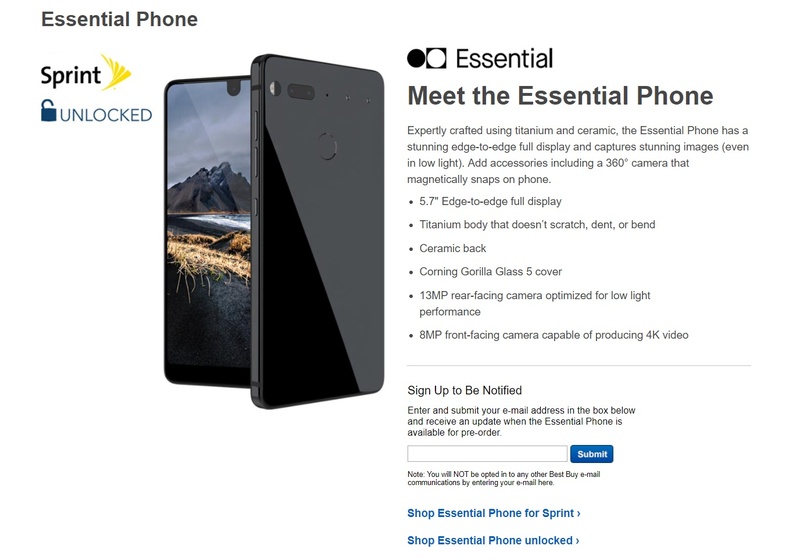 The Essential Phone has been listed on Best Buy's online store. Sprint and unlocked models in black and white colors are up on the site, although they're not available for pre-order yet. Andy Rubin has had a hard time getting his new phone in customers' hands. Pre-orders of the Essential handset were supposed to ship over a month ago, yet none have so far. Late last month, Rubin personally assured everyone that the phone is coming, and soon; if this new listing on the Best Buy website is any indication, this time he is right. Just as expected, Best Buy has two versions of the Essential up on its site: one for Sprint and one unlocked. Both come in two colors, Pure White and Black Moon. These are essentially (no pun intended) the same Essential models that were available for pre-order earlier this year. A quick look at the specs list confirms what we already know about the handset. It runs Android Nougat 7.1 (although it doesn't mention if it's version 7.1.1 or 7.1.2). A 5.7-inch screen, Snapdragon 835, 128 GB of storage, 13-megapixel camera—it's all there. There are two differences between the Sprint and unlocked models. The first is rather obvious: Sprint's version is locked to that carrier, while the unlocked version is compatible with the big 4: Verizon, T-Mobile, AT&T, and of course, Sprint. The unlocked Essential phone also works with various prepaid mobile services, including Cricket Wireless, Tracfone, and Simple Mobile, among others. The second difference is peculiar. An unlocked Essential phone cost US $699, but according to PC World the Sprint version costs $50 more, or $749. Both phones are identical, which makes the difference in price strange, indeed. The numbers may be incorrect—in fact, Best Buy no longer has the price for the Sprint version up on its website. Since the phones are not available for purchase yet, there could be a correction between now and when pre-orders go live.